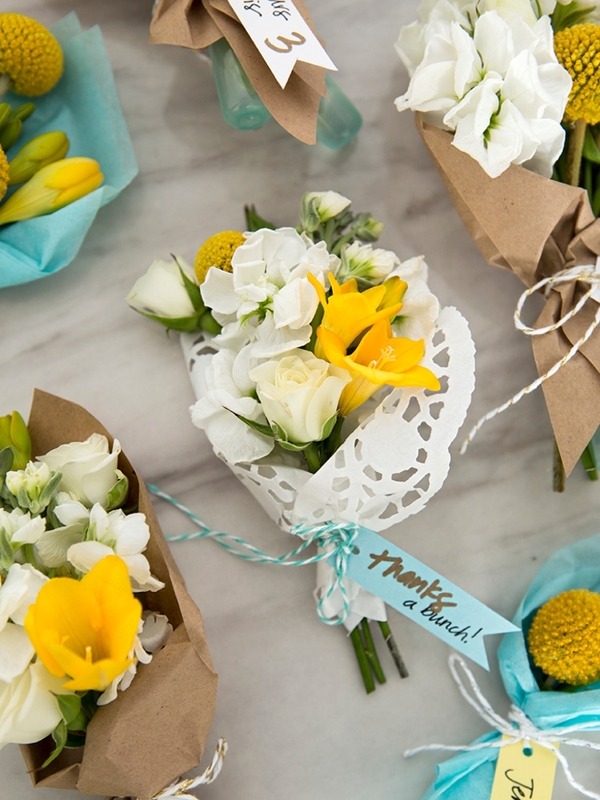 WOW, These DIY Mini-Floral Bouquets Are The Absolute Cutest! 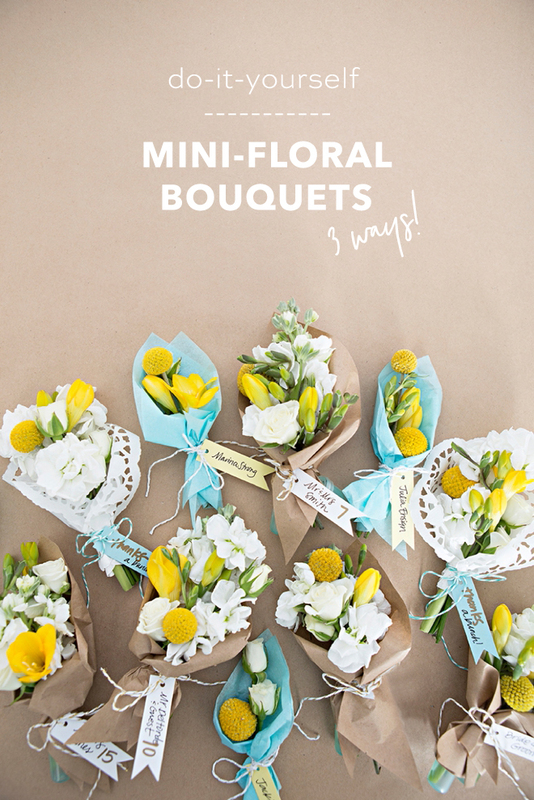 For our second DIY Flower feature with FiftyFlowers (you might remember our first one the Floral Hoop Decor), we’re making the most darling mini-bouquets you’ve ever seen! 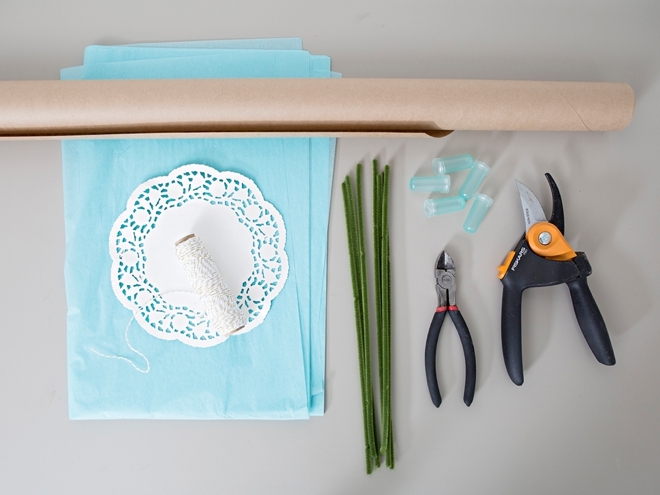 Here I’m using a FiftyFlowers DIY Flower Combo Pack, which is a thoughtfully curated collection of flowers and foliage, perfect for the DIY bride and projects like this. These mini-cuties are wrapped with three different types of paper; kraft, tissue, and doily – but you can wrap them in anything. 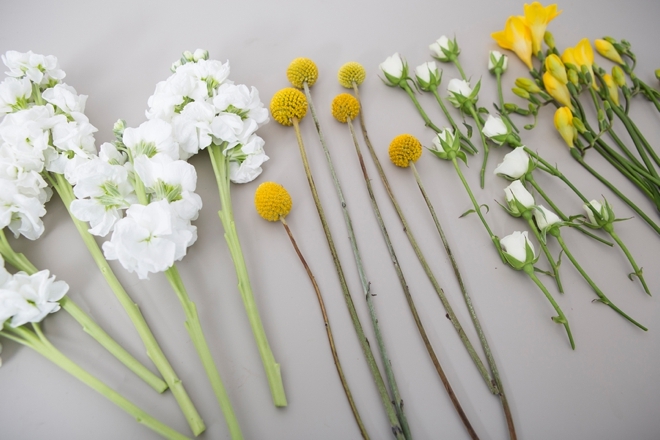 They are incredibly easy to make, so even if you’ve never worked with flowers before, you’ll do just fine. 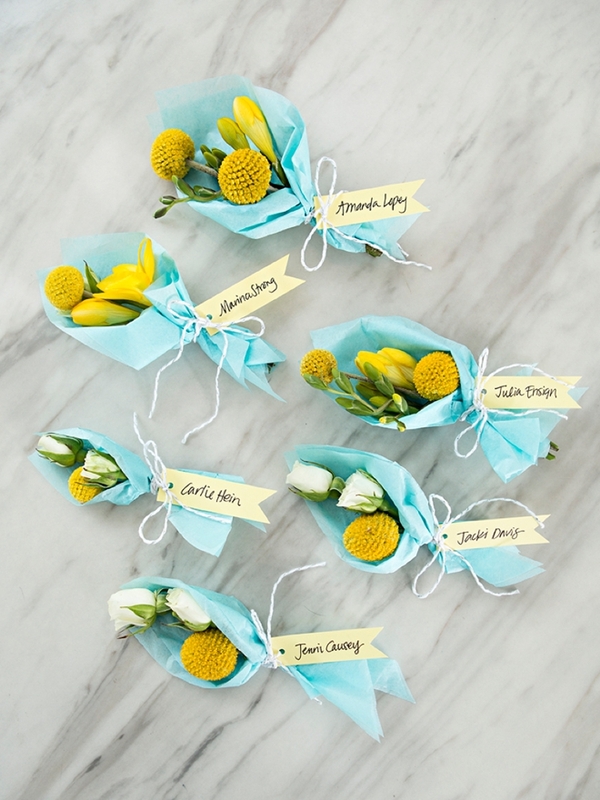 We think these would be the ultimate seating card or favor for your garden wedding or bridal shower! 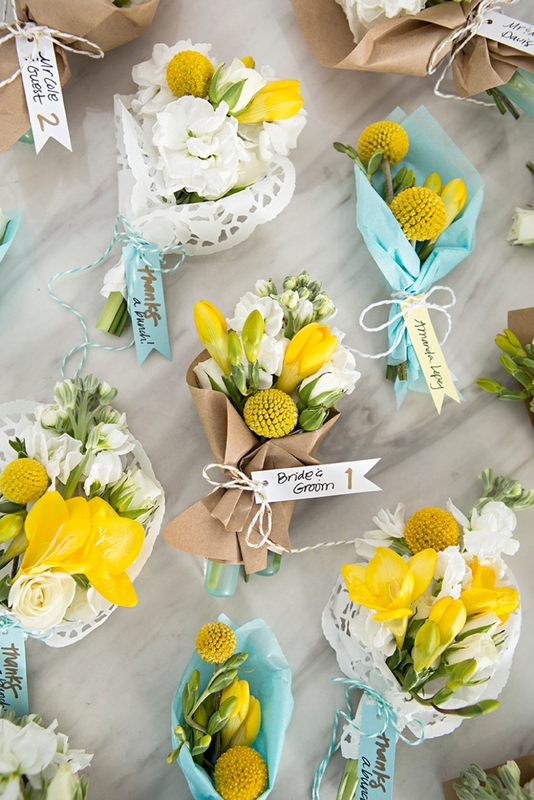 From kraft paper to tissue paper, to doilies and even fabric – you can wrap these mini-bouquets in pretty much anything! I would have to say the kraft paper turned out to be my favorite… what do you think? 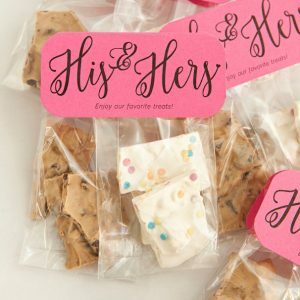 Our free tag printable at the end of the post! This pack of flowers was incredibly easy to process, clean and prep for this project. Simply pull all the leaves off the stock, spray roses and freesias, then cut the stems down to 5″-8″ to make them easy to work with. 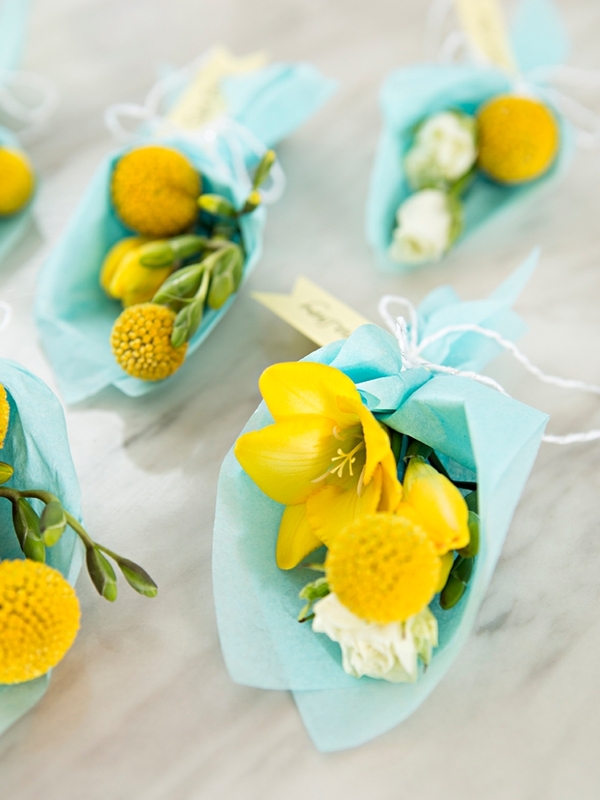 You can use any type of paper or fabric to wrap these darling little bouquets with. We found that a triangle of paper worked great. To find the right size, take a regular piece of printer paper and fold it to make a square. Then cut that square in half to form an 8.5″ x 8.5″ x 12″ triangle. If your bouquets are a little bigger or smaller, you can adjust your wrapping triangle size as needed. Whether you’re going to give these cuties out as favors or use them as seating cards, feel free to print and use our FREE tag pattern! 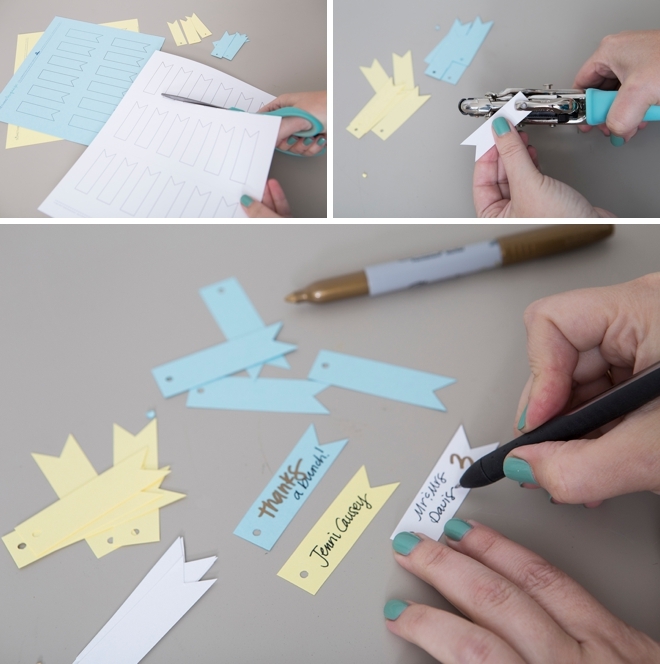 Cut out each tag, hole punch, and write your guests information. Cut the 12″ chenille stems into thirds. 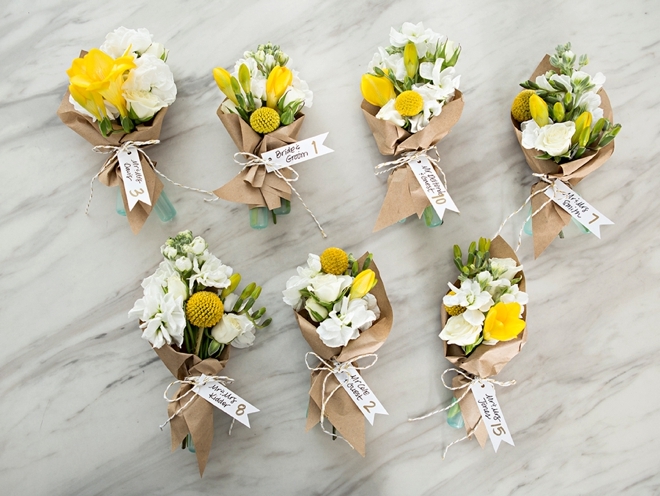 ***If making these the night before your event, you’ll want to put the stock and freesia stems into mini-water tubes. If making them the day of, it’s not necessary but they will last longer. 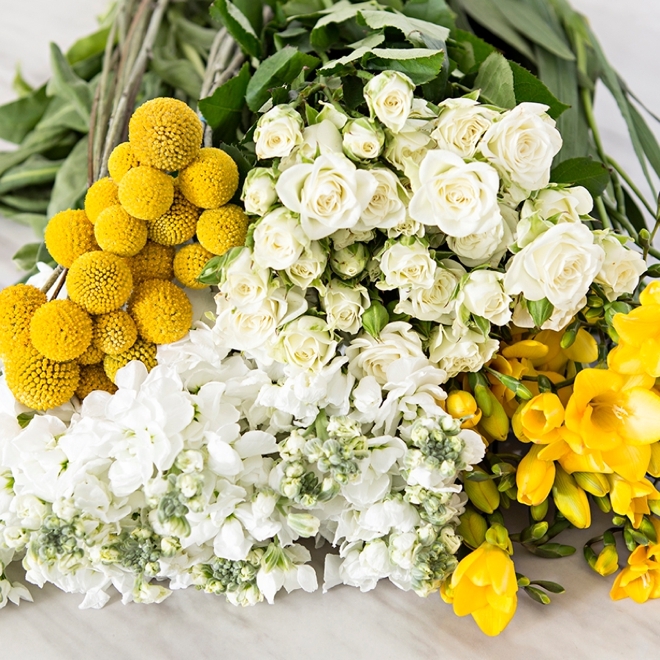 Build your mini-bouquets by layering your largest flower first, in this case, the stock, then freesia, the spray roses and finally a billy ball or two. When you’re happy with your design secure by wrapping with a chenille stem! 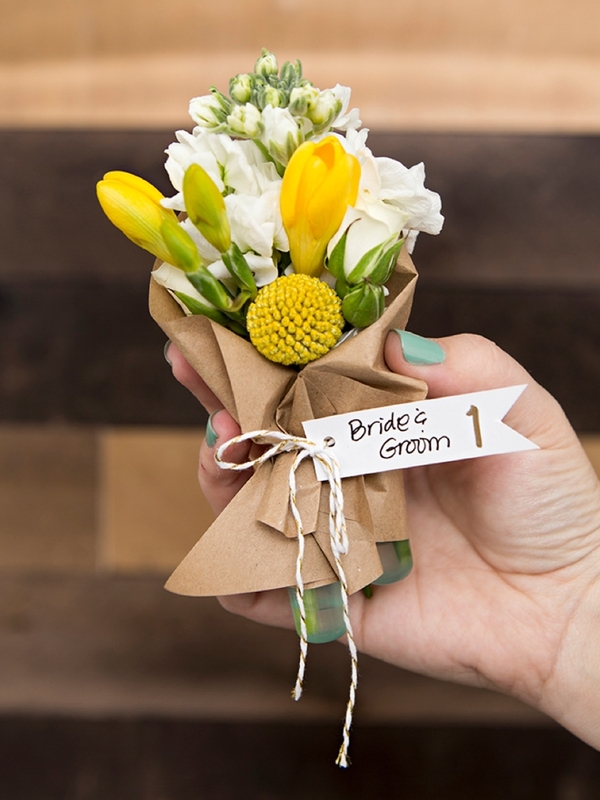 Wrap the kraft paper around your mini-bouquet and secure with twine or ribbon. Then add a tag! 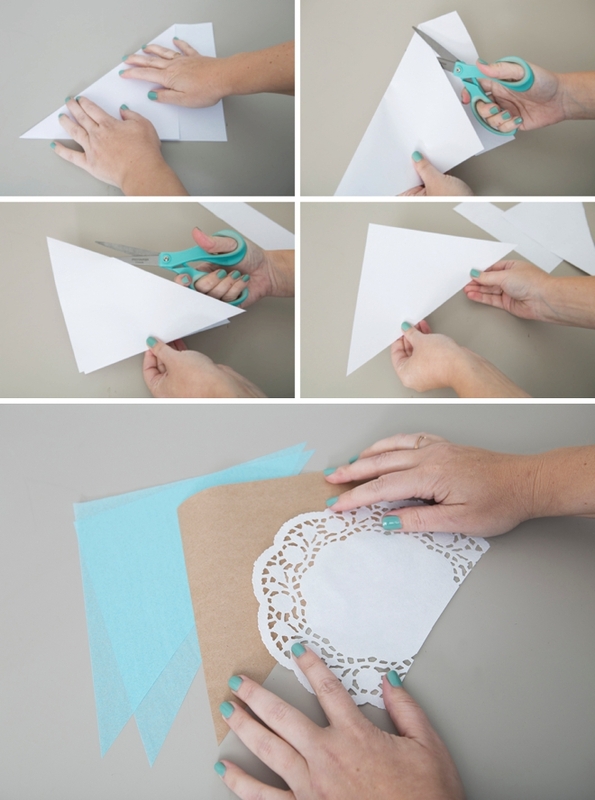 Wrap the tissue paper around your mini-bouquet, being careful not to tear it, and secure with twine or ribbon. Then add a tag! 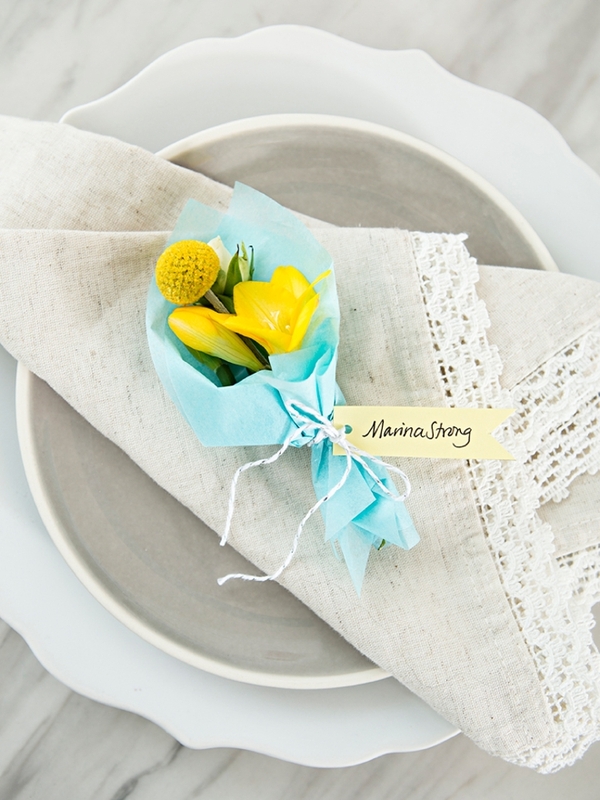 Wrap the doily around your mini-bouquet, being careful not to tear it, and secure with twine or ribbon. Then add a tag! 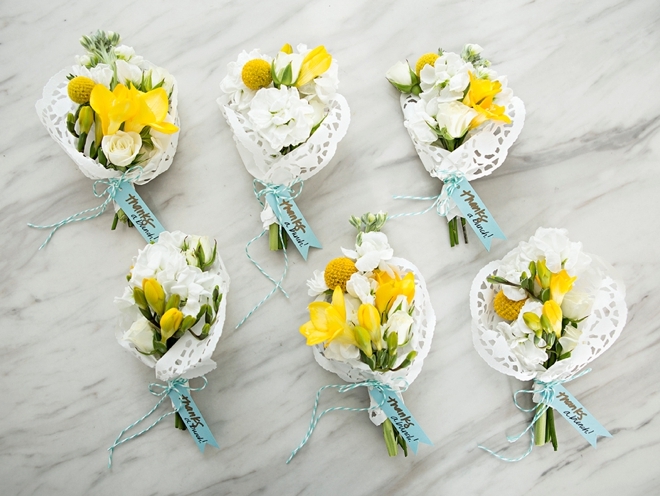 If you’re planning a garden wedding, smaller mini-bouquets would be the perfect seating cards. 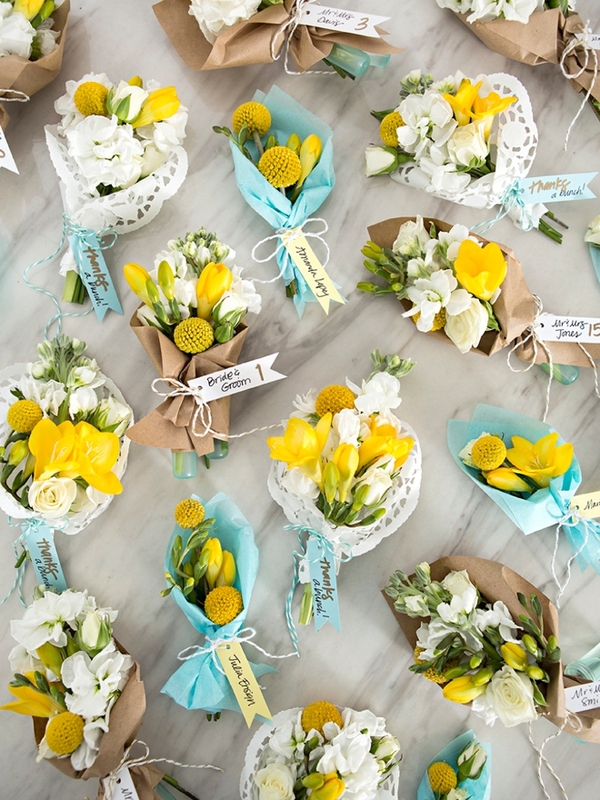 If you’re bridal shower is coming up, these would make adorable favors for your guests… and since Mothers Day is right around the corner, you could whip up a mini-bouquet for some of the awesome Moms in your life that live localy!